Aussie foursome remembers the (good, indie) '90s. The Aussie (now Tarheel) foursome who comprise the Sleep-ins are strong proponents of truth in advertising. 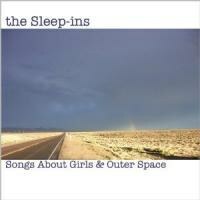 Not only is their 8-song mini LP Songs About Girls and Outer Space exactly that, but, their sound is as broad and expansive as the view-from-the-tourvan-windshield pictures captured in the album's liner notes. Opener "Silver State" marries spacey keys, spiky arrangements and an overt love for '90s guitar-centric indie (Pavement's Spiral Stairs seems to be a frequent touchstone). The lumbering guitar workout "Chrome Skull Cape and Matching Codpiece" nearly lives up to its awesome title, while album centerpiece/jam "Tonya, Extraplanetary Spaceship Girl" stands as the band's finest moment, and not just because it incorporates both of the album's titular notions. The splintered chant of "Desertsong" doesn't quite gel the way the Sleep-ins might think it does, but the band has the good sense to end on the triumphant crescendo of "Bug On My Face". With the '90s indie comeback in full-swing, these guys may have traveled halfway around the world (to say nothing of the universe? ), but they're in the right place at the right time now.